PNW District Optimist Clubs: Be a part of a worldwide movement to bring out the best in kids. Ask me how! Be a part of a worldwide movement to bring out the best in kids. Ask me how! This is my 100th post to the PNW District Optimist Blog! Hooray! That means there has been a lot of positive activities that benefit kids around the the world, but especially in British Columbia, Alaska, Idaho, Oregon and Washington. Thank you to all of our Optimist Clubs for all that you do. This post is about how you might create that opening. You can create a passive marketing opportunity every time you send an email just by adding a line below your signature such as "You can be a part of the worldwide movement to bring out the best in kids. Ask me how." 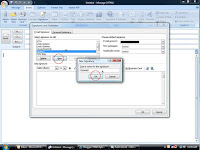 In the toolbar of the new message dialogue box choose "Insert"
From the drop down menu choose "Signature"
In the signature dialogue box choose "New"
Write your signature and choose "Save"
Click on the illustrations to enlarge. Thanks to Steve Andersen, Immediate Past Governor for the suggestion.